HUA HIN: Police are looking into whether to take legal action against a man who challenged the national police chief, the army chief and the prime minister to a gunfight in a video clip that went viral on social media. Hua Hin Police Superintendent Pol Col Sitthichai Srisophacharoenrat said investigators were waiting for doctors’ reports on the mental health of 52-year-old Songwit Sukprasert. 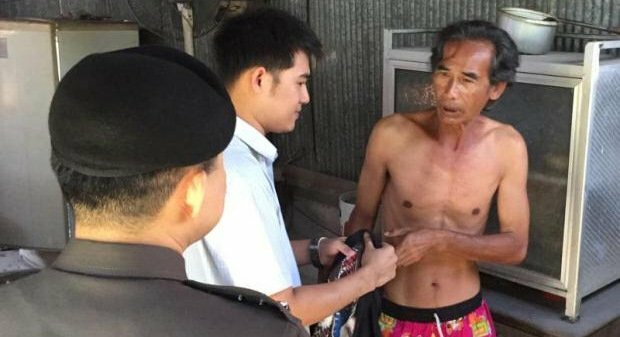 Mr Songwit was taken by authorities from his house in Prachuap Khiri Khan’s Hua Hin district yesterday (April 21) after the expletive-ridden video clip challenging Royal Thai Police Commander Pol Gen Chakthip Chaijinda, Royal Thai Army Commander-in-Chief Gen Chalermchai Sittisat and Prime Minister Gen Prayut Chan-o-cha to a gunfight went viral. In the clip that has received numerous shares since Thursday, the man wearing a brown shirt and red shorts with sunglasses approached a policeman who had parked his motorcycle alongside a road and was apparently shooting the clip. Once he was close to the officer, he launched a foul-mouthed tirade about the three leaders and challenged them to a gunfight. The man also said his name was Songwit Sukprasert. Police later confirmed his identity. A rumour circulated yesterday that Mr Songwit had been killed but authorities denied the rumours. Col Sitthichai said Mr Songwit would be taken to Galyarajanagarindra Institute in Bangkok to undergo mental health tests. Investigators who searched Mr Songwit’s home said one of his relatives told him Mr Songwit had a traffic accident in 2004 while riding a bicycle to work. He suffered a brain injury and underwent an operation.